New Terrain Brewing has a unique Valentine’s Day offering: Beer & Truffles. Emma Marie is 14 year singer-songwriter from Northern Colorado. She has appeared on Little Big Shots UK, Spring 2017. is endorsed by Daisy Rock Girl Guitars and is picking up steam all over Northern Colorado. Don’t miss her open the show! The Deep Pocket Thieves are comprised of singer-songwriters Jimmy Ayers on keys and slide guitar, and Larea Edwards on vocals and violin. the pair began writing together in 2015. The band includes Emmy award winning Mahlon Hawk on bass and percussion; Seth Bennett on drums and percussion; Kirby Velarde & Alissa Chesis on Guitar, Christin Grant on backing vocals and guests Sarah Hubbard on violin and Sammy Mayfield on guitars. The band is currently picking up steam all over American radio charting with their newest release “Blue De”…which can be found in music stores, Amazon, iTunes and more! In Europe, New York and Los Angeles, rhythm and blues guitarist/vocalist Sammy Mayfield made a name for himself during a three-decade stint as the musical director for legendary soul and gospel shouter Solomon Burke. In Denver, where Mayfield was raised, he’s one of the city’s premier bluesmen who is Loved and touted by all…Sammy Mayfield IS a true musical legend!! Two 8 ounce custom scented candles. You and your valentine will choose from over 80 scents and blend your own creations. Two beverages: Choose from our wine list, beer, or soda/water. A floral bouquet from Golden’s “Blumen” flowers. Two petite cupcakes from Gold Mine Cupcakes. Learn more and buy tickets…. Schnepf’s, Indulge Bistro & Wine Bar, the Briarwood, Maki Sushi, and Dirty Dogs Roadhouse, Table Mountain Inn, and the Bridgewater Grill in the Golden Hotel are all having Valentine-themed dinners tonight, and Jolynn’s is hosting a Lonely Hearts Club party. You can also stop in at Golden Sweets and buy some beautiful, top quality Valentine’s Day candy! New Terrain Brewing will celebrate Valentine’s Day with beer & truffle flights. Join us for a flavordome of deliciousness! We have joined up with the Master Chocolatiers at Copia Confectionary to marry 5 of our brews with 5 perfectly crafted truffles! Check out the tantalizing tastebud experience below. Tickets are limited, so if you want to participate, buy your tickets now. Maki Sushi has created a Valentine’s Day Special Dinner for Two – a four course dinner which includes fresh and delicious sushi, appetizer, soup for two, sushi rolls and dessert – all for $63 (please see attached photo of the Valentine’s Special). This Special is available on 2/13 and 2/1r. Maki Sushi is known for its fresh and mouth-watering sushi. Our sushi chefs are very creative with our sushi dishes from fresh fish and ingredients. Our famous Jalapeno Bomb, Spicy Girl roll, Salmon Belly Sushi or our new Hotate Maki – just to name a few – are among the many favorites of our customers. In addition to a variety of Japanese cuisine, Maki Sushi also serves Thai dishes. Our Panang Curry or Drunken Noodle are spicy and delicious, and are our non-sushi customers’ favorite dishes. Maki Sushi also serves a variety of Sake from Nigori (unfiltered Japanese Sake) to Dai Ginjo Sake. We will start serving Sake flights on Valentine’s Day where customers can sample a variety of our Sake. Reservation is recommended for our Valentine’s Day Special. Looking for a Valentine’s Day present? Creekside Jewelers is the only Denver-area source of Marahlago. This beautiful line of jewelry features beautiful Caribbean-blue stones which are found only in the Dominican Republic. Creekside Jewelers has a large selection of jewelry in a wide range of prices. Visit the store and select a beautiful Valentine’s Day gift for your loved one! 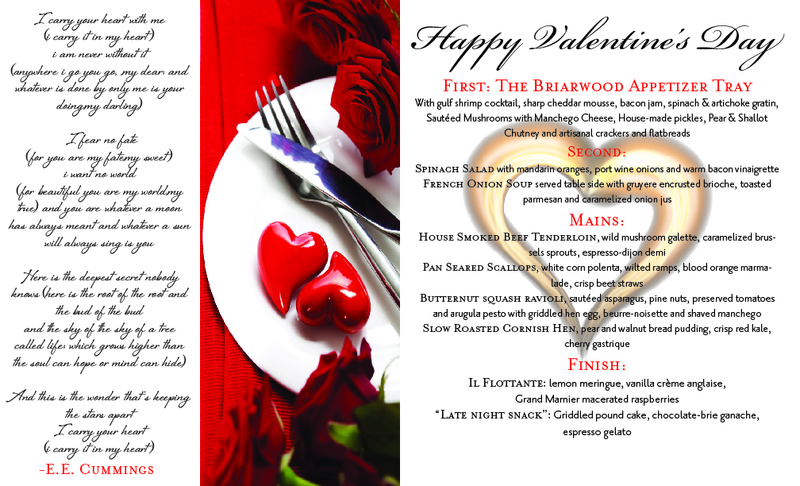 The Briarwood Events Center is offering two ways to celebrate Valentine’s Day: Tea on Saturday, or Dinner on Wednesday. Join us for a special Afternoon Tea. Enjoy extra special sweets, loose leaf teas, warm scones, tartlets & finger sandwiches, finished with refreshing sorbet! Reservations. Celebrate Valentine’s Day with Gold Mine Cupcakes. Back by Popular demand…..Daddy Daughter date day!! Come dressed in your Sunday Best!! We will be having a 3-course “Candle light” Pizza dinner complete with real menus, fancy tables, music, a photo booth and chance for dad’s and daughters to create their own Valentine’s! There will be THREE different time slots to choose from this year: 11:00, 12:30 and 2:00 pm. Please call to make your reservations AHEAD of time. Space is very limited! Cost is $15/pair. Each Additional person is $5. Can’t wait to see everyone there!! The Urban Escape Day Spa has a romantic offer for you: come in for a Couples Massage or a Decadent Duo Service for Two between today and Sunday February 19th and receive complimentary chocolate covered strawberries and a glass of wine after your service(s). Must complete couples service(s) between 2/10/17 – 2/19/17. Spa Gift Cards are always a welcome gift!